Autumn is a tarty season… not that there are loads of young lassys pottering around in skimpy dresses. No No, this is the buttery crust filled with berry kind…. the kind i personally prefer. I got into the tart making mood after watching last weeks “tart week” on the Great Irish Bake Off. Unfortunately, it’s another poor recreation of the EPIC original that is the Great British Bake Off. The Irish version is filled with cupcakes, failure and fondant… lots of fondant. There isn’t a clear winner yet, no one has really shone through. I’m routing for the half dutch lad though… purely on the basis that i have a dutch weakness and I hope there’ll be a streak of some dutch baking…..gevulde speculaas anyone? So here you are, a mixed berry lattice pie that goes really nice with a dollop of whipped cream. Start by sieving the flour into a large mixing bowl, add in the cubed butter and begin to rub in the flour with the butter with your fingers. This process may take a while but it can be quite therapeutic (if you want to look at the bright side) rub together until it feels like breadcrumbs and there are no lumps. Then, add in the sugar and mix with a spoon. In another bowl, beat an egg into the water and then add this mixture a little at a time into the flour mixture. Bring the dough together with your hands and if too brittle add more water but in very small amounts, and if too wet add a little more flour. Then, you should have a soft but not hard ball of dough, also not sticky. Divide the dough in half, shape into 2 balls, and pat each into a disk. Cover with some cling-film and leave to rest over night or if you’re in a rush, an hour in the fridge. Remove 1 dough disk from the fridge and roll it out on a lightly floured surface. Roll it out enough to cover/fit a 23cm pie/tart dish. Trim the edges to there is about 2cm of an overhang and pop back into the fridge while you prepare the filling. Combine all of the ingredients for the filling in a medium sized bowl. 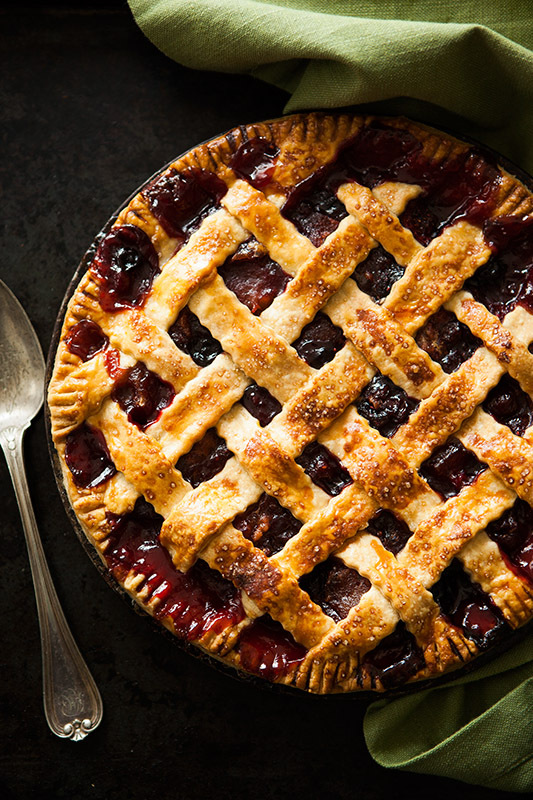 Stir with a wooden spoon and gently mash with the back of your spoon to release some of the juices…(don’t mash enough where it’s just a sloppy liquid jam) Pour the berry mixture into the chilled pie crust. Roll out the remaining dough disk into about the size of 30cm or as close as. Using a pastry wheel (or even a pizza cutter) cut 12 1.5cm strips of dough. Arrange the strips over the pie filling in alternate rows, weaving 6 horizontally and 6 vertically. I found this video quite handy for getting your head around placing the strips. Trim the edges so that the edge of the pastry is the edge of the tin or plate. Then, crimp or press the pastry down using a fork like i did or something else to press them together. Preheat your oven to 22o°C or 425°F and put the pie into the fridge for around 15mins or so. When you’re ready to bake your pie, i’d advise putting it onto a baking tray lined with tin foil as some of the juices can leak and that will lead to one messy oven. Bake for 15mins and then reduce the temperature to 180°C or 375°F and bake for another 35mins or until the crust is a lovely golden colour. Let to cool on a wire rack and enjoy. This pie is gorgeous!! I definitely want to make this for Thanksgiving! Oh my, there is an IRISH bake off? I can only imagine what it’s like… But this looks like the pie of my dreams! Ha there certainly is aimee…you should try and watch it online. oh my gosh, this looks stunning! berry pie in any variation is one of my very favourite things. also, i absolutely adore your blog – it’s so beautiful! Do you have the ingredient measurements in something other than metric? I live in the USA, California and have never mastered the metric system. and indicate that they should be unloaded first. Has anyone ever said, “It would have been awesome if only it was in high frame rate 3D”.